When good-looking David Chavez comes to Christmas Town to serve as the local pastor, the last thing he envisions is becoming attracted to one of his parishioners. Pretty Liz Martin is talented at more than handicrafts and caring for babies during her day job at a nursery. Shy Liz is also adept at turning outgoing David’s head. Yet—after years of romantic disappointments—Liz has given up on finding true love. Then special seasonal cookies lend a hint of holiday magic to happenings at the Corner Church, and Liz starts to wonder…if she can dare to believe in miracles and happy endings. First and foremost, I love Ginny Baird’s Christmas Town series. Ginny has this ability to transport the reader into the pages of her books. Even when it’s not cold outside and the winter season is months away, I can still feel the spirit and magic of the holiday season coming through the pages. I don’t think I’ve ever read a true Christmas series before. Over the course of six “book years” the Christmas Town series has introduced six couples and allowed readers to fall in love with them. The books range from overly sweet to closed door romances. For the most part, the books have all been standalones without spoilers of the previous books. I’ve always said the first book, The Christmas Cookie Shop, should be read as a way to get an introduction to all the town residents. A Corner Church Christmas is different. It seems Ginny made a point to make this book easy for new readers to meet and understand the previous characters. But Ginny has included a few spoilers in the form of mystery solving. Liz Martin has lived in Christmas Town pretty much her whole life. She’s always seemed to be the person sitting on the sidelines watching everyone else meet, fall in love, and marry the love of their lives. She doesn’t date. And has secretly been waiting on her own Prince Charming to find her. David Chavez has found his calling to be a minister. He loves what he does and believes he’s good at it. When his older sister, Gloria, gets married in Christmas Town, Tennessee he travels from Miami to be apart of the wedding. Never in his wildest dreams did he expect to meet Liz whom he finds to be electrifying. Liz and David have a secret crush on each other and things get really interesting when David moves to town temporarily as interim pastor for the Corner Church. During the annual Christmas Bazaar, David bids on and wins a box of Hannah Livingston’s famous Virginia Cookies. The cookies come in three variations and are rumored to inspire various outcomes. The Charity cookie inspires good works, while the Clemency cookie fosters forgiveness, and the Commitment cookie inspires true love. When David eats the Charity cookie he gains this uncontrollable need and desire to do nice things for Liz. Once Liz figures out what’s going on with David, she starts to wonder if the rumors about the cookies are true. “There’s much more to Christmas Town than meets the eye.” Liz always thought there was something about two established families in Christmas Town and her and David set out to discover any secrets hidden in plain sight. While Liz and David spend time together, comparing notes on what they learn, they slowly start to fall for each other. Liz and David are two people who have not dated for various reasons. Christmas Town is a place where everyday dreams come true. “There’s no greater magic than the magic of the heart.” While they try to fight their attraction to each other, the magic of Christmas Town, the holiday season, and true love’s desire bring these two together in a fairy tale setting. I’ve always felt there was something magical and mysterious about Christmas Town, and there is. You can see and sense it with all the couples in the first five books. But I wondered how Ginny would bring that “special magic” to a couple where neither had the secrets of Christmas Town running through their blood. I couldn’t figure out how she was going to make this book just as special and then “zzt!”, it all made sense. 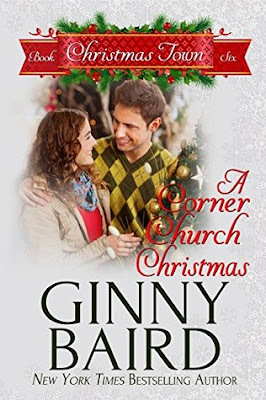 A Corner Church Christmas is the final full-length story of the series. There are two more novellas, featuring Joy and Noelle Christmas. I’m looking forward to what I know will be a wonderful second-chance love story and what will potentially reveal Christmas Town’s most long kept secrets.